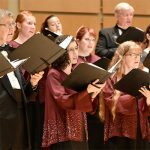 We’re Singing with the Oregon Symphony during the Holidays! Great News for the Oregon Chorale! We have been invited to sing with the Oregon Symphony at their annual Comfort and Joy concert. The Chorale will sing with the Symphony and then have an opportunity to showcase our talents with four numbers of our own. Join us at 7 p.m. on September 17, 2017 at the Arlene Schnitzer Concert Hall in downtown Portland.